OK Ok so the title isn't as catchy as last weeks Fast and Frugal. 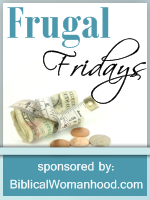 But there is some great things in in this post so please keep reading it will defiantly help you be frugal. I love having a freezer. It is probably the main reason (oh besides those hours of searching for deals and meal planning) why we save so much money and how we can live on $50 a week for grocery's. Here is how my freezer comes in handy. This week well searching through the local grocery store I saw that an 8 pack of whole wheat hamburger buns were on sale for a 99 cents. This is a great deal seeings how you can't even buy store brand for that cheap. So without hesitation I quickly piled some into the chart. When I got home I took all the buns out of the bag and laid them on a cookie sheet and stuck them in the freezer. That evening I took them out and placed them into sandwich baggies. I like to have them individually frozen instead of stuck together. That way when Kitkat gets a mini pizza for lunch he can have 1/2 the bun and I can get it out and cooked quickly before he has a total melt down. Once they are all into baggies I put all the baggies back into the big bag and they get tossed into the deep freezer until needed. Picking up breads and rolls when on sale can really save in the long run. Nothing like throwing some burgers on the grill to find that you don't have anything to put it on. Side note ~ We love buying the bulk pack of hamburgers from Costco. For $13 you can get 24 quarter pounders. I don't usually like premade burgers...actually I never liked them but these burgers are 100% lean ground beef nothing added what so ever for a $1.89 a burger that I didn't have to mush together with my hand I am game!! Why I brought up the burgers is because they are a quick meal and nothing like scoring the buns that are only ~0.12 cents this makes a very fast throw together meal for last minute supper or lunch guest! Hey readers. 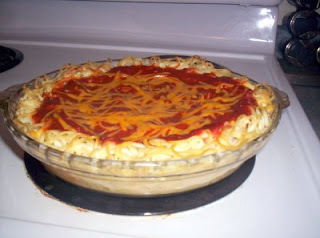 Today I am re directing you to Meal Planning Mommies website where they have posted one of our favorite left over recipes, Spaghetti Pie. The last time we had this for left overs I also whipped up some of these delicious bread sticks that I found over at Tammy's recipes. A delicious, simple and frugal meal! Can't beat that. This is on our menu for next Monday and I can't wait! I love going grocery shopping in the mornings for a couple of reasons. 1. The babe is super happy in the morning. If you ever see me grocery shopping please forgive me if you think I am rude and don't stop for a long conversation. These puppies get taken up quickly so I am always frantically running around the store filling my chart up. I usually never buy vegetables like this. For this bag of 14 oz its $3.50. I know many of you readers in the states are shocked but that is how much we are paying for things like this. So for $1.50 (each) I picked two of these up, with a meal idea in mind. I had never made broccoli soup before but really was craving the challenge of making a yummy broccoli cheese soup. I did a quick search on Google and looked at a couple of recipes before decided to head over to Tammy's recipes to see if she had one that I could use. I really enjoy Tammy's site. Her recipes are so user friendly; meaning I usually have all the ingredients in my cupboards. I followed her recipe and whipped this delicious soup up in under 30 minutes. Ok so I just double checked the recipe and realized that I didn't follow it to a tee. For one I don't usually keep chicken broth on hand but I always have chicken (and beef) OXO, so I mixed that up in 4 cups of water. Also we didn't have any cheedar cheese. I know you think this would stop me from making a broccoli cheese soup. But let me explain we have an abundance of process cheese slices (a nice present...thanks mom) which I decided would work just as well. And they did the trick! We served the soup with a yummy toasted onion bagel. I will be making this soup again with the other bag I got on sale. I took that bag and chopped it up onto a cookie sheet and frozen it. Once frozen I placed it into a Ziploc baggie. Now I am ready to whip this soup together again when I need a fast meal. I was thinking this would be great for those Sundays were we impulsivley invite someone over after church. Wow...I can't believe how fast the weeks are going by. Soon enough we should be getting some warmer weather. Although hubby and I have decided that even though its soooo cold out right now we are choosing to be thankful for each season. This thankfulness was brought on buy a local business's sign that said...OH I just can't wait for the mosquitoes to come back. Many of you reading from Moncton may remember the infestation of those pesky little guys we had last summer. The fast and frugal staring Penne Rigate and Cream of Mushroom Soup is one meal you don't want to miss! This delicious mixture of star ingredients is a great lunch or supper meal. Once Penne is cooked cream of mushroom does his job of reuniting Penne with frozen veggies and turkey leftovers. This is a one pot meal that will have your family feed in no time and raving with great reviews. Penne Rigate is back in The fast and frugal part 2! This time Cream of Mushrooms sister, Tomato Soup, is starting in this one pot dish along side of lean ground beef. What a flavorful meal when combined with spices and frozen veggie may even do a guest appearance. Now doesn't those descriptions make these two meals sound exciting! hehehe. Both of these meals are so easy, fast and frugal to make. And when accompanied with some frozen veggies or salad these meals meet all 4 food groups. The reason the milk is in the first picture is because I like to mix my soups with a little bit of milk to make the meal a bit more creamy. Some other things I add especially to fast and frugal dish one is cream cheese if I have any floating around in the fridge and some Parmesan cheese. So readers let me hear about your "fast and frugal" meal ideas. If you have a meal that is super easy to whip up (5 ingredients or less) let me know and I would like to post it here for you! Cook noodles, drain and add can of soup, milk, turkey and veggies. Let heat up and serve! Cook noodles, drain and add beef, soup and milk. Parmesan may be added as well. Serve warm! Hey readers. I want to introduce you to my new kitchen helper. He still has some getting use to the different utensil in the kitchen and their proper uses but I am sure once he realizes that, he will be cooking away like mama in no time! I want to share with all you readers a wonderful cleaning company called Norwex. My sister in law was given a gift this summer from her sister of some Norwex products. After trying these products (I am sure just once) she was sold. With 4 children running around her house what housewife wouldn't want cleaning products that don't require any chemicals at all. Soon after receiving this gift Deja had our family and friends convinced of these magical wonderful cloths. 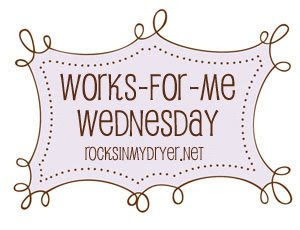 And since she is a stay at home mom she decided that she would be become an independent Norwex consultant and sell these products here in the Maritimes. I have been waiting to post about these products since I held a Norwex party before Christmas and got some great products but I have been waiting for Deja to get her website up and running. You can jump over to Norwex healthy cleaning to find out about Norwex, why to chose Norwex and product usage guide. For the products I will be talking about all of them are linked back to her page as well where you can find more informative information about the product. So with no further waiting let me tell you about the wonderful products I have from Norwex. First off... the Norwex Dust mit (isn't my model cute!!). This wonderful mit is so easy to use and picks up dust like nothing I have ever seen before. Once its full its hard to even shake the dust off of it. If you have a dust allergy like me, this will be great for you. It doesn't just push the dust around to some other place it actually picks it up!! This is a great cloth and probably one of their biggest things!! You can read this blog post which will tell you why the cloth is so great. I use mine mostly in the bathroom to clean the tub, sinks, mirror and shower doors. One thing that Deja did when she was here doing a Norwex party was she scrubbed my shower door with this puppy, with a bit of elbow grease, and polished with the window cloth (listed below) and tada the scum came right off the doors. I love the cloth for keeping them clean!! If you have kids you know how dirty mirrors and windows can get. This cloth works so great for getting them clean and streak free. I use my Antibac cloth to wash the window and then use this to dry it. I actually just did the shower doors tonight to be sure it would clean them perfect and it sure did. It also works well for the computer screen. This cloth is a bit too big for me to use in the kitchen as an everyday cloth. We did love it for the sliver specks in it that helped to clean up the mess at the bottom of our pots and pans. I don't have this product but Deja does and she used it on my mattress, couch, chair and nursing rocker. I do have a severe dust allergy and found that this has been helping my symptoms. I noticed it the most in the nursery after she sprayed the chair I can sit in their for more then 10 minutes without going through a box of Kleenex. I got this as a hostess gift (along with all the other products I am telling you about...it really pays to host a party) and find that it really shines up my lens and takes all of the babes figure prints away like nothing. These are great in the kitchen and are used for those big crusty messes that usually occur in the pots and pans. The great thing about these is that they have been sitting out on my sink now for a month or so and there isn't one little bit of rust under it. 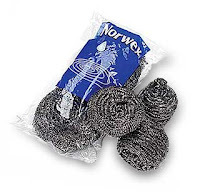 Another thing that these are great for is cleaning the stove top. They really get it looking nice and white again. This detergent has been doing a great job. As a mom with a baby in cloth diapers it works great getting the diapers clean, smelling fresh and even looking white (like they should). I have been using this bag since boxing day have probably done over 30 loads of laundry and still have lots left. The great thing about this stuff is I only use about 1 Tbsp. So readers I think that these cleaning products work for me and my family. I really enjoy just being able to wet the cloth and go. I have my cleaning bucket under the bathroom sink and don't have to worry about having lots of cleaning chemical bottles around for the little guy to find. They are an investment but its worth it! If you would like more information about the products or would like to book a party here is Deja's contact information which can also be found on her website. Just to let you all know that hosting a party is great. Deja is very informative and fun! Also with hosting a party you get the bonuses of hostess gifts!!! I love making my own granola bars. Not only is it cheaper but you get a granola bar that has all your favorites in it. Lately I have been making these once every two weeks and experimenting with different ingredients. Right now I am enjoying lots of crushed peanuts and shredded coconut. I have been making this recipe for a while and just recently revised it after figuring out a few tips to help the recipe be a crispy granola bar instead of granola. Here are a few tips for making a crispy granola bar. 1. Instant oats work the best because they are nice and small. However if you buy large flake oatmeal you will need to grind it up. I use my mini food processor or my coffee grinder. 2. Grinding large ingredients such as peanuts, almonds and large chunks of fruit. 3. Greasing the pan does not work as well as lining it with greased parchment paper. The paper makes it easy to slide off the cookie sheet and it peels right off the granola bar. 4. I was trying to cut them well they were hot. Not a good idea; its better to let them cool completely. Combine all ingredients, mix well. Press firmly into well greased cookie sheet lined with parchment paper. Bake in pre heated oven 350 for20 minutes. Cool completely before cutting. For more cool kitchen tips head on over to Tammy's site. Last weeks menu went really well! I even tried a new recipe for broccoli soup (delicious) that I will be posting later this week. This weeks menu is pretty simple but I have some bulk cooking to do. I need to have some vegetable purees (sweet potato, squash, carrot and potato) made up for the babe. We are having a little bit of a hard time getting him to eat some of the foods we are eating so I figured if I stock up his basket in the freezer at least I will have some foods on hand for him when we are enjoying spicy foods. Also this week potatoes are on sale so I am going to be doing up some fries and I am thawing out a large pack of hamburger that I will use up tomorrow for my shepherds pie and some meat balls. Ok... every blog I have been on lately has been talking about valentines day! I really LOVE this day as well. What better way to celebrate love then to stuff your face with tons of chocolates, use red food coloring to dye everything (including your fingers) and use those heart shaped cookie cutters for breakfast, lunch, supper and snacks! 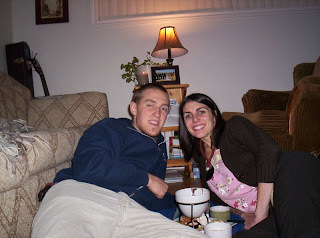 So here is my post on treats and special things we have done over the years to celebrate this day of LOVE. Hubby and I did made these delicious cupcakes for a pot luck we had this past weekend. I found the recipe over on Amys notebook which is orginally taken from The Farm Chicks. and hubbys were creatively done!! Last year we celebrated valentines at our small group so I whipped up these cupcakes to take there. 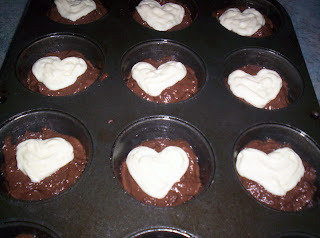 They are a chocolate cup cake with a cream cheese heart baked in the center. They looked a lot nicer before they were cooked!! hehehe...I must keep working on that recipe. For our youth group last night at the church I whipped together some sugar cookies (a recipe I usually only make at Christmas) and we used the left over icing from the cup cakes to decorate them. I am not sure if the kids even tasted the cookie with all the colored sugar and candy hearts that were on them. Each year we enjoy doing a special breakfast, usually heart shaped pancakes topped with fruit, syrup and whip cream dord the trick for us! A couple of years ago when I was doing my internship hubby whipped together this specail evening (after he cooked me my favorite meal; KD and Hotdogs!!) of a fondue pinic on our living room floor. I have been using this valentine for years now. When we were in university our Christian fellowship group decided to make these and hand them out all over campus with our information the back. What an impact they had and what a turn out we got. Its Awesome to think that God sent the first valentine and how cool is it that we get a special day to to celebrate and show Christ's love!! There are lots of cool ideas out there to do for this day and as the babe gets older I plan on doing lots of fun things to celebrate LOVE. Here are a few cool ideas for you readers! Enjoy and have a happy LOVE DAY!! This week I was signed up to bring the "healthy snack" to our moms club. Even being a dietitian I still am unsure what "healthy snack" is. So I put my creative mind to work and came up with a little twist on one of our favorite treats. Cinnamon sugar tortilla crisp are a big hit around here in the summer time. We really love them dipped in strawberry salsa, flavored cream cheese or just by themselves. I also like making different flavors, such as spicy, to go with our Mexican dishes or Parmesan to dip in soups. But this valentines day here is a "healthy snack" you can send with the kids for their school party, take to work or serve the family at home. 1. 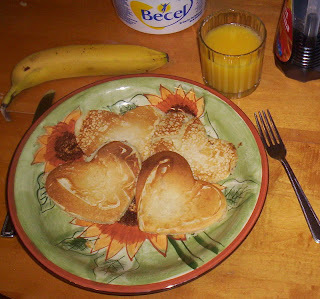 Cut out heart shapes from the tortillas. ~ Enjoy them with a dip or by themselves. Jump on over to Shannon's site for my great ideas. Saturday was a very busy day for me as I had lots to get done before heading out to a friends baby shower. Hubby was home and decided to make a traditional Saturday night New Brunswick meal of baked beans, scalloped potatoes and homemade bread. This was quite a project of him to take on but he did it with full force!! I came home to hubby in an apron, potatoes boiling, cheese sauce in the making and the babe was stuffing his face with cheerios. Since we were having guest for supper I quickly washed up throw my apron on and got to work as well. After punching down the bread and putting it to rise in the bread pans I got to work on dessert since that had been over looked. I knew that I had a big container of rice left over from our Mexican Lentil casserole the other night and when we have left over rice there is one dessert that I love to make. Probably why I cook too much rice sometimes!! *I will give you the recipe that I have. However I always change it and just eye ball the amount of milk and rice because I always use leftover rice that we have opposed to instant white rice. 2. Beat the egg with the vanilla. Stir some of the hot rice mixture into the egg (1/4 cup); beat the warmed egg mixture back into the remaining rice mixture. Cook, stirring constantly, for 1 minute. Remove from heat. 3 Preheat broiler. Spoon the pudding into oven safe serving dishes. Top each dish with an equal amount of marshmallows, chocolate and pecans. Broil on the middle rack in oven for 30-60 seconds, or until marshmallows are golden. ** One thing I did was I made up all the rice dishes then broiled them right before we were ready to eat dessert. This way they were nice and hot! Hey to view some more kitchen tips head on over to Tammy's site! This month I actually planned my whole month out for meals. What a time saver that was this week since we were out all weekend. This morning I simply had to get the calender out of my house binder to see what I had planned. For my month of meal plans I simply made each day a theme (Monday Meat/potato and veggies, Tuesday veggie, Wednesday leftovers, Thursday casseroles, Friday take out, Saturday random, Sunday Soup or stew) then under each day I wrote out 4 different meal ideas. Now for the easy part I inserted the meals into my calender to tada...my month is planned!! 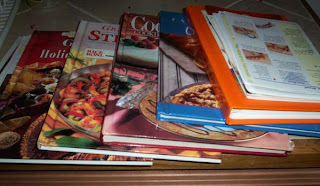 I am sure like me many of you have stacks upon stacks of cook books, recipe cards and lose pieces of paper stuffed in every cook book with recipes you got from friends scattered all over the kitchen. During the Christmas season when I was taking things down to be replaced with my Christmas decorations I decided that it was time for some of my cook books to go and for some of them to be packed up to be stored down stairs. I decided to do this because the internet has such an abundance of recipes on it and whenever you are in a pickle and need recipe Google has TONS ready for you in seconds. There are many sites that I love to go to get a recipe as I find the reviews are good. When I find a recipe that I enjoy I usually go to the print this recipe or printer friendly version; once there I copy the recipe and paste it into my google docs. Google docs is one way I keep my kitchen paperless. I love how all my recipes are stored there and they have a search tool so I can find all my recipes in a jiffy!! Taste of Home: Has delicious recipes and usually a picture to go with each recipe. I always like seeing what the product will turn out like. Also they have lots of different categories of cooking that you can search through. They have a membership as well that allows you to create your own recipe box there. I like this site because their recipes don't call for wacky ingredients that I usually don't have stocked in the cupboards. All recipes I love this site because of the pictures and the reviews. The reviews always help make the recipe better as you can learn what not to do or what to add to make the recipe better. Also there are usually many different recipes for the one thing you are trying to make. I think there are at least 10 recipes for baked oatmeal. The search bar is great for when you are looking for a specific recipe. This is a delicious muffin recipe, found at all recipes, that my friend made for us a couple of weekends ago when she was here. If you have other recipe sites that you use please let me know so I can add them to my list!! 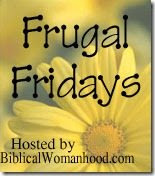 Also for more frugal ideas head on over to Biblical Womanhood. Some of you may have already read this post but I wanted to re post it to show how you can make learning scripture fun!!! One of my biggest Christmas gifts this year was making a bible memory verse game for our nieces and nephews. You see last Christmas they received a gift from their parents which was the whole collection of PSALTY. Now I don't know how many of you readers know about Psalty but he is a big blue singing song book who sings praise and worship music. Micah and I have our own collection of Psalty and enjoy singing along. Eben has been hearing this wonderful music since he was in the womb and now dances around the house to it. Anyways back to the game I made!! The reason the game is connected with Psalty is that Psaltys camping adventure is one of the best CD's and one that the kids love. On this specific CD there is on song called Hide Gods Word in Your Heart. Its a song that teaches kids how to memorize 26 verses!! What a great song. So my idea was born. I would make a memory game (since memory is one of their favorite games) using the bible verses from their favorite CD. Hopefully this will help them learn and memory 26 powerful verses from God's word. The frist couple steps of the project were a little diffcult. Orginially I wanted to make the game out of costers but that was a lot of costers to try to find so my dad gave me 2 big sheets of pylwood. I sat down one night and drew 52 4* 4 squars, then my wonderful husband cut them out with a skill saw and together we sanded them so they would be smooth. All the verses (list at the bottom) were typed on the computer, printed out and cut with fun scissors. Hubby made the logo for the tops of squares and the letters were cut out using a Cricut (a very fancy scrap booking tool that a lady from our church let me use). Hubby and I plan on making another one of these games for our own children. What a great way to get kids memorizing God's word. I guess it's not just for kids as I have learned the 26 verses and can almost sing along with the CD. My time was the biggest investment into this gift because I think it coast me a total of $7.00 and that was mostly for the large bottle of Mod Podge. Please forgive me if my meal plan post doesn't make sense this week but I am sitting at my parents house, with a wood furnace, and I am sure its 30 ++ degrees in here right now. Also I have my husband cheering at the top of his lungs at the TV as he LOVES the super bowl. Its funny cause we don't watch football any other time of year but this special occasion. I don't know if its the Nachos, chicken wings and pop that go with it that makes me even love the super bowl or what...so I will make this quick cause I think the first around of food is almost done!! One recipe that I made this week to go with my spaghetti pie was these delicious garlic bread sticks found over here at Tammy's recipes. The recipe was easy to follow, used ingredients all found in my pantry and tasted delicious. The recipe will go into our family favorites. I will try to remember what I have planned this week cause I am working on a monthly meal plan for this month. I have give each day a theme (example: Monday casseroles) and have written out meals under each theme. Each week I will just pick meals from my list to make my weekly meal plan. Following me?? hehe...I will post my themes and meals for the Month when we get home. Thursday: can't remember I will have to double check my menu.